2011 will be the year when the likes of Novak Djokovic, Andy Murray, Robin Soderling and Andy Roddick look to end Rafael Nadal and Roger Federer’s hold on men’s tennis. The years first major is just two weeks away and the world’s best only have a few tournaments to prepare for the Australian Open, which is why it’s a surprise to see just two of the world’s top ten in Qatar this week. Nadal and Federer head the Qatar Exxon Mobil Open betting and Nadal is the slight favourite at 11/10 to win this week with Federer 5/4 to win in Qatar. It’s a sign of their dominance that their nearest competitor in the betting market is Nikolay Davydenko, available at 8/1 with Jo-Wilfried Tsonga priced at 10/1. Davydenko and Tsonga safely negotiated their first round ties, and the Qatar Exxon Mobil Open betting market suggests Nadal and Federer should do the same. Both players are priced at 1/100 to beat their first round opponents, the shortest odds possible, and should either Thomas Schoorel (facing Federer), or Karol Beck (facing Nadal) win, it would be a mighty shock. So punters need to look elsewhere in the Qatar Exxon Mobil Open betting to find some value, and a first round match-up that offers potential value is Ivan Karlovic vs Lukas Rosol. The 25-year-old Rosol is a Czech qualifier who will be hoping to upset Ivan Karlovic, who has suffered a dramatic loss of form and has slipped to 73 in the world rankings. Karlovic is 8/15 to beat the qualifier, but it may be worth taking on the Croat and Rosol is available at 11/8 to beat Karlovic. 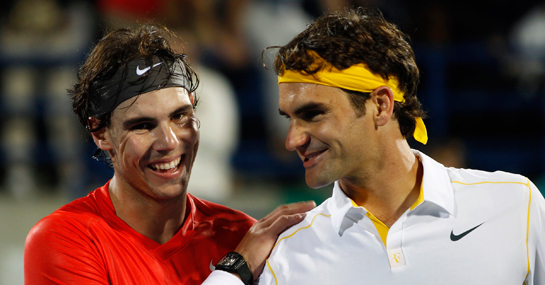 Whatever happens, the first tournament of the ATP calendar looks set to be a predicatable Nadal vs Federer final. A £10 stake on Nadal winning this week would return £21. New customers can sign up here for a free £10 bet.